Facebook to show people what they could be harvesting, too. 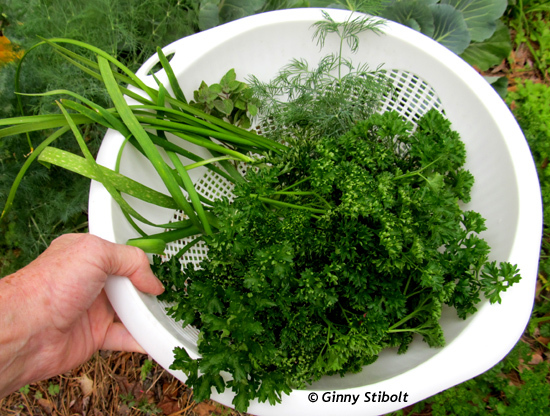 This is a tabbouleh harvest includes lots of curly parsley. We started growing food successfully a few years after we moved to North Florida in 2004. So we have a good record of our food costs both before and after growing crops. Our annual food budget is at least 15% less than it was before. 1) Obviously, we save money when we don't have to purchase as much food. 2) More importantly, cooking to our harvests has changed the way we eat. Our whole diet has become more plant based and we also purchase much less pre-prepared food. Why would we purchase salad dressing full of preservatives and other stuff when I have frozen containers of yummy, home-made pesto that we can use as a base for salad dressings? Also, we've found or invented some interesting recipes to consume an abundant harvest and not get tired of it. See below for a new recipe adapted from one I'd found on Facebook.